A few months ago I had the privilege of receiving a VoxBox from Influenster with some awesome products from Victoria's Secret workout line. Today I wanted to share a new review from my most recent VoxBox from Influenster and Dove. 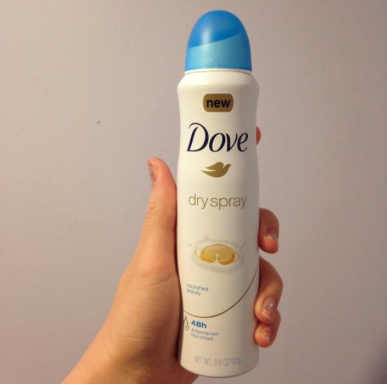 I received a new spray deodorant from Dove and surprisingly, I love it! I prefer using deodorants that aren't harsh on skin and that don't have the metals and chemicals that make them antiperspirant because they're bad for your skin and honestly they make my skin feel chalky. After trying this new spray deodorant though, I liked it more than I thought I would! It wasn't heavy and it dried almost immediately. I reapplied it later in the afternoon because I was doing a lot of running around that day. It smells great and works well too! I give it two thumbs up!